Eminent international women leaders from the aviation industry will converge at the 2nd Women in Aviation General Assembly on May 15th to promote the higher participation of women in the Middle East's robust aviation sector. Airport Show 2017 is being held from May 15-17 under the patronage of His Highness Sheikh Ahmed Bin Saeed Al Maktoum, president of Dubai Civil Aviation Authority, chairman of Dubai Airports, chairman and chief executive of Emirates Airline and Group. The ‘Arab Women in Aviation’ conference is supported by key industry stakeholders, including Sky Prime Aviation as Platinum Sponsors, Mubadala and Strata as Silver Sponsors and Boeing, Etihad Airways Engineering, Commercial Bank International, Abu Dhabi Aviation, Royal Jet, Maximus Air, MSI Aircraft Maintenance Services and Air Navigation Services of Sweden as the event's General Assembly Sponsors. 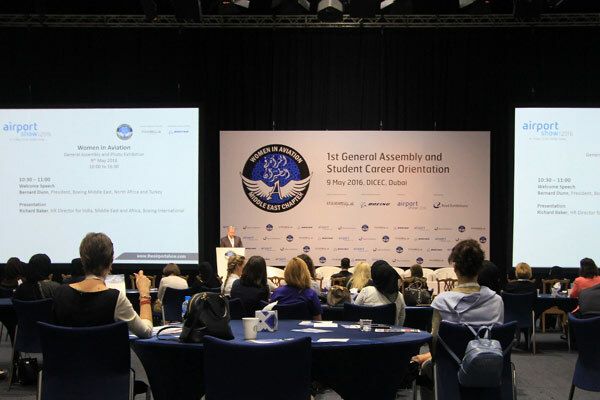 The first general assembly of Women in Aviation, held in 2016, was a record success with the major participation from women professionals across the aviation sector such as pilots, engineers, managers and training and recruitment professionals. The general assembly and career orientation programme will provide the participants an opportunity to get inspired and hear women who are motivating millions with their success in this sector. Among the sessions will be a special panel on ‘Inspirational Stories’ of the most successful and talented women in aviation around the world who have made it to the top of their organisations, a session exploring the wide spectrum of roles in aviation, as well as a practical guide on how to excel in these roles for aspiring young professionals, a presentation on key developments that will shape the Middle East's future aviation landscape and the economic stimulus these will create for the region and a panel discussion on preparing the aviation leaders of tomorrow.